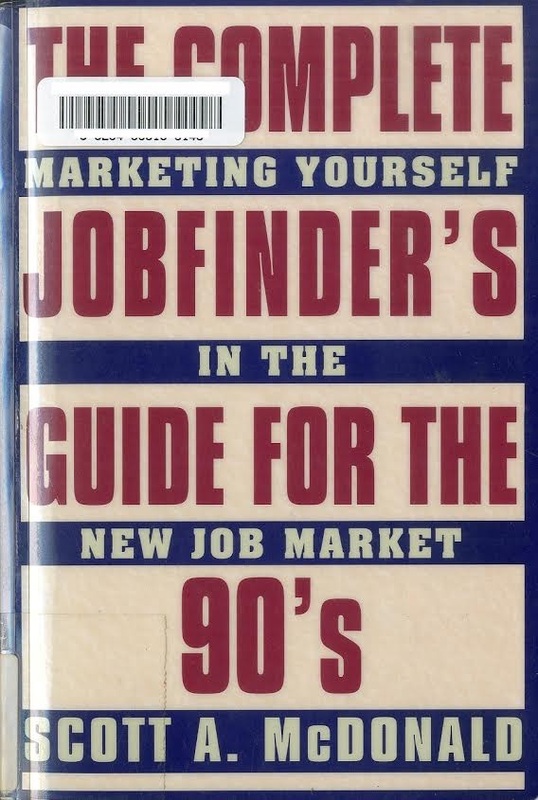 Holly: Why in the world would any public library keep this in a career section? Whyyyy? 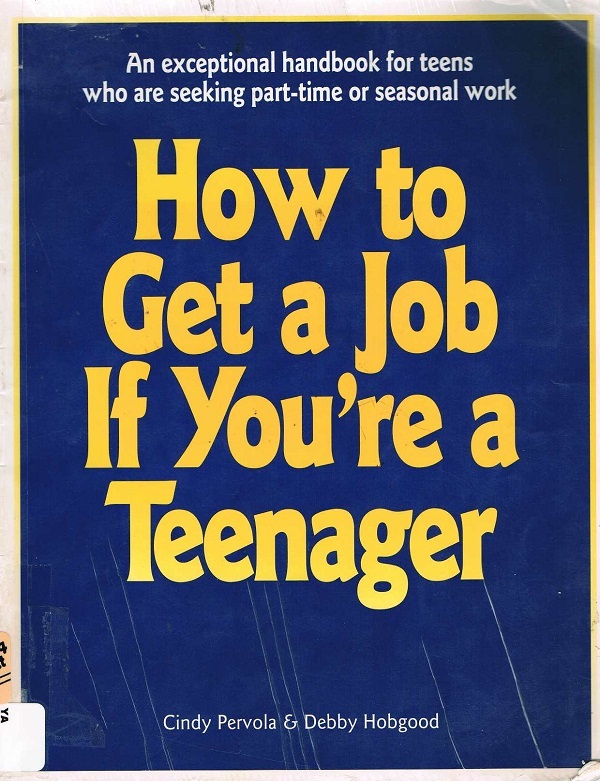 Bring this book to a Library Board meeting to explain why the staff MUST be allowed to weed. What possible argument could they give? As a non-librarian I have to ask, are their library boards that seriously object to librarians pruning things? Even stuff like this? So, library boards vary a lot from place to place. In general, they are people who have a certain amount of time on their hands and feel some kind of connection to their libraries, or they may be people with poltical aspirations and agendas that have nothing to do with the library’s mission. In the case of weeding, the former can be almost as dangerous as the latter. Folks who are romantic about their library or their own library experiences may think that the library should have all the books they remember reading there years before. There is also a general sense of shock among citizens that librarians should ever “throw away” books – something that is seen as akin to book-burning, which raises all kinds of emotional responses. 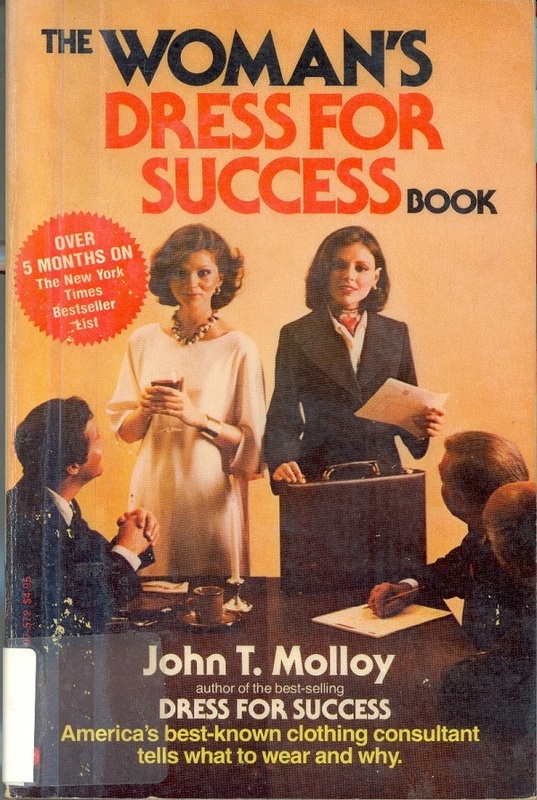 We also had a ton of books that told patrons what their antiques were worth… in 1972. Our directors had giant sticks up their butts. They also saw no need to ever buy new books as long as we had so many “perfectly good” books already. Like HIV/AIDS books from gorram 1987! No gloves. No mask. No good. Sometimes I wonder did germs exist back then? 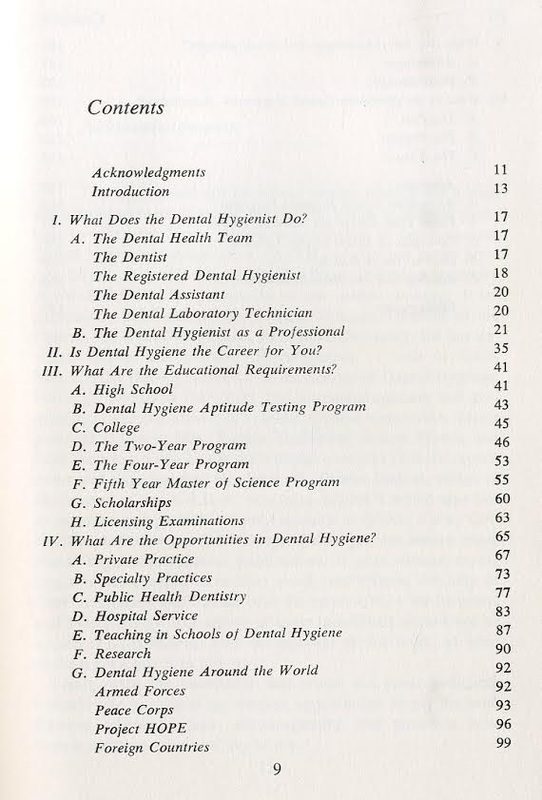 A friend of mine is a dental hygenist. She’s in her late 30s, and has colleauges who are in their 50s who remember the days when you didn’t have to wear gloves to perform dentistry. She was telling me how a couple of them still reminisce about how they would pick up sweets with their blood-covered hands, and surreptitiously stuff them in their mouths, while they had their backs to the patients! I don’t understand this. Even before there was HIV there was hepatitis! In hindsight it may not have made much sense, but it was very much standard practice at the time. Bloodborne disease just wasn’t seen as an issue. Me either – disgusting any way you look at it! Perhaps — but what we didn’t know didn’t hurt us. Most of us, anyway. 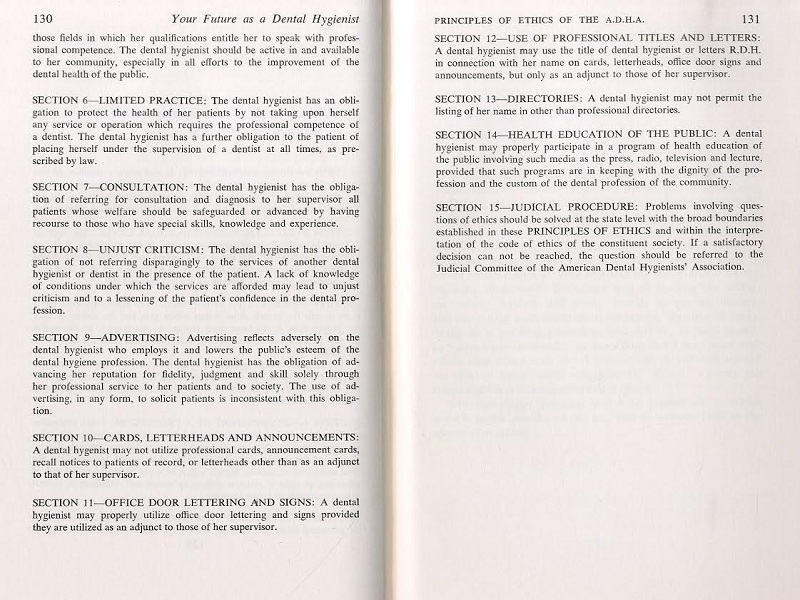 And when this was written, hepatitis and other diseases were not as well researched as they have been since then. Not AIDS, not in 1969. 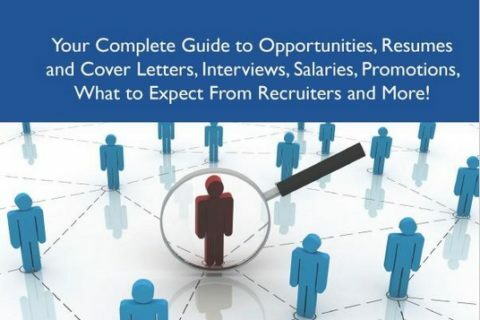 The woman on the cover looks disgusted. 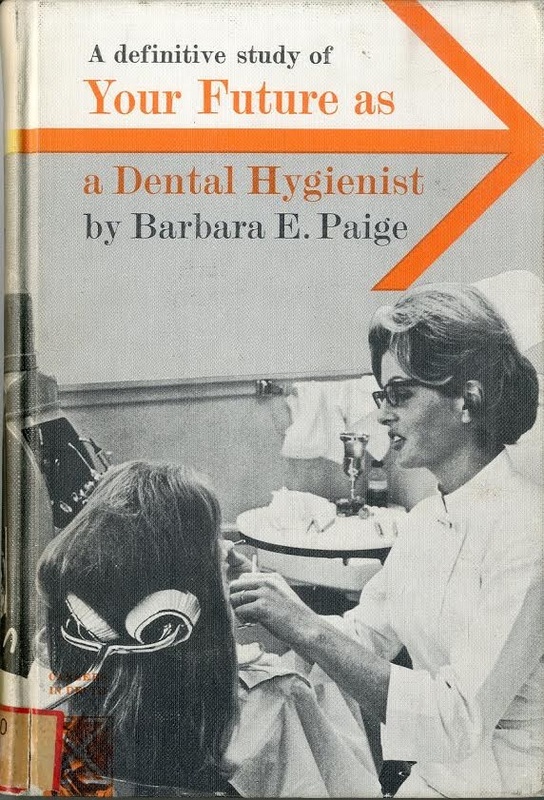 I wonder whether she was actually a dental hygienist or perhaps a model. 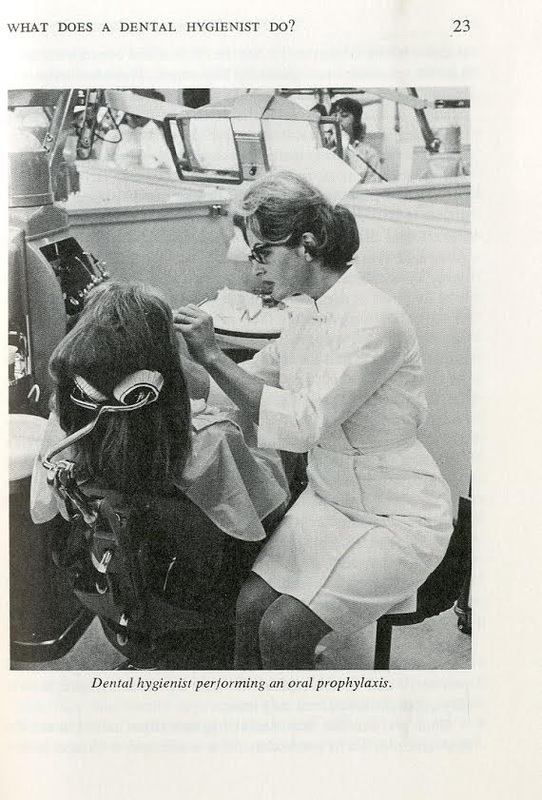 I love the authoratative shot of the dental hygienist making an appointment. Action packed! And the absolute latest in scheduling software…paper! The ethical code at the back is pretty weird. No advertising? For some reason, I thought those headrest things were nifty LOL. I remember going to visit Miss Cotton, with her finely lined skin, soft fingers (yep, no gloves), perky hat and white uniform, including “nurse shoes” — the office was on an upper floor of the Park Building, and the view from the chair was out the window at the City Hall clock tower (modeled after the Palazzo Vecchio in Florence, I believe), with sky behind it. And pigeons flew past. I guess my visits were not traumatic! 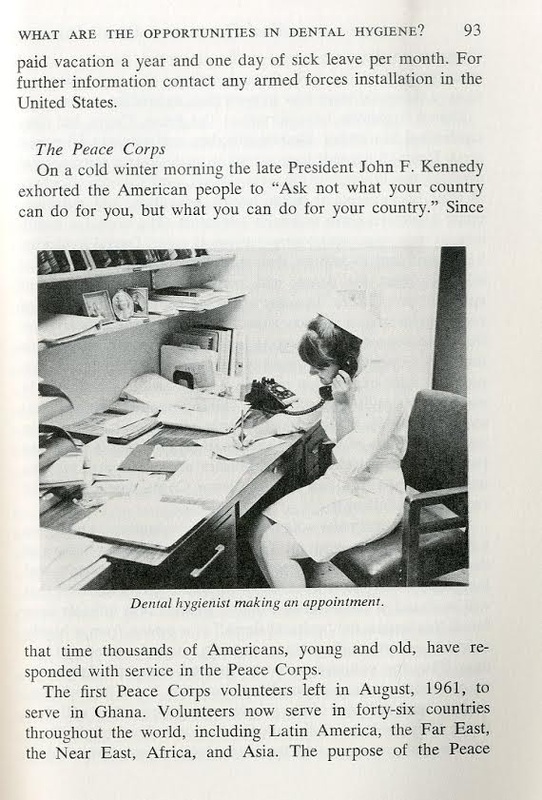 When I first saw the cover, before reading the book’s copyright date and references to JFK & the Peace Corps, I actually thought that this book was MUCH older than 1969, such as a book from the ’50’s or very early sixties.